City-building always has been a genre towards which I had mixed feelings. It's very interesting and it is very satisfying to watch my city prosper under my leadership. But because of its nature (imitating a city) when one thing go down everything follows. That infuriates me so much that I usually stop playing for some time. But I always return to the genre. 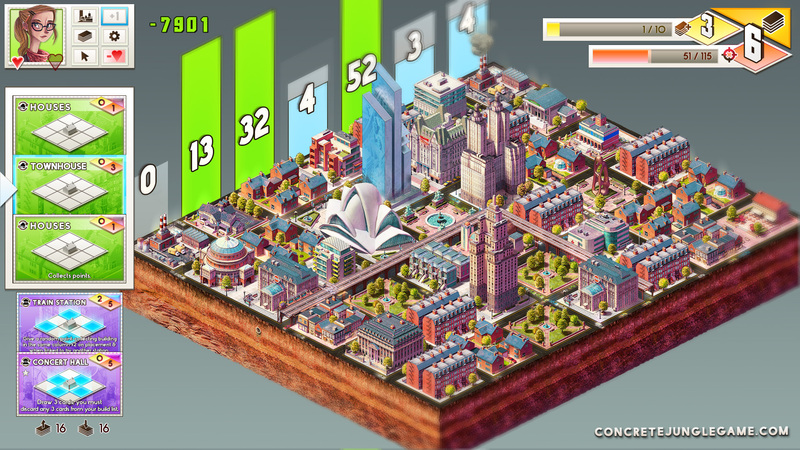 My come back this time is with a small game called Concrete Jungle. Work of the small indie studio ColePowered Games the game appeared on the market on 23th 2015 and while almost no one spoke about it, it turned out to be a hidden gem. Concrete Jungle is deck-builder. With a twist. In most deck-builders you have constant market from where you buy new cards for your deck. 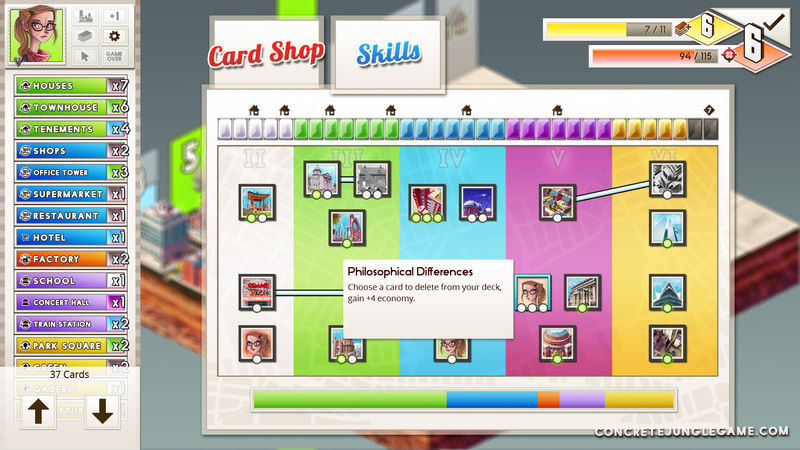 Here you don't have this, instead every time when you collect certain amount of "money" you are present with the option to choose one card or to take one "ability" which most of the time is also a new card. The difference is that the abilities give more control over what you get. Unlike the market where the cards are random. The game has 8 characters with different abilities which give you plenty of room for experimentation and creation of different decks. The idea of the game is to get certain amount of points by reaching block thresholds which is done by building different buildings. The trick is that only certain buildings collect points while others buff building squares and there are such that even debuff squares, but provide other things. You also gather points from blocks only if previous blocks are collected. You can force remove blocks, but it costs lifes and doesn't give you points. Add to this the strong puzzle element that Concrete Jungle has with all the building fitting in the most harmless place and you get a game that will make your brain hurts. The game features more than 200 cards which you will unlock gradually trough the campaign where you will try to save a city from its foolish mayor. And when you beat it there are other mods to try including competitive local and co-op play as well as versus AI mode. Concrete Jungle is also a good looker and has a decent sound plus fully voice acted story mode. And mentioning the voice-acting most of them sounded really fake and forced to me and while it is probably done to add to the funny story that goes through the campaign, in the beginning they were rather annoying to me. Concrete Jungle is interesting mix between a city-building and deck-building game, where you will have to carefully plan your moves or face the consequences. The main objective of the game is to reach certain thresholds and clear blocks by placing point collecting and manipulating buildings. 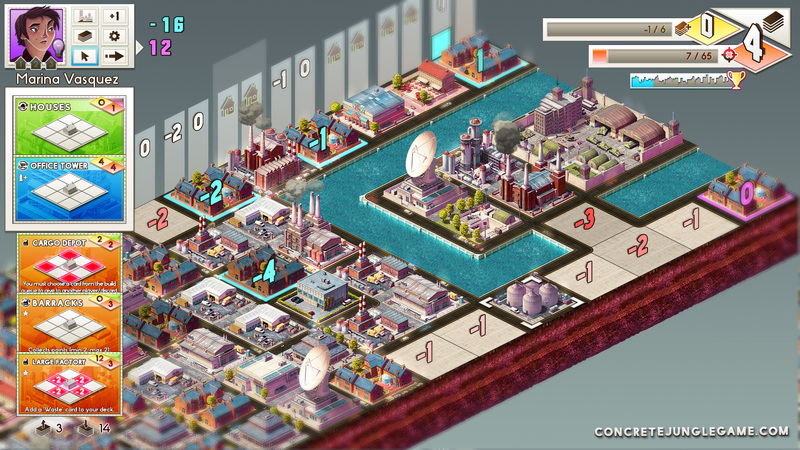 At the start you will build simpler buildings but by advancing the campaign you will unlock fancier things like business towers, military bases and skyscrapers. But while it is colorful and relaxing at first Concrete Jungle will make you use your brain in later levels where you will need every trick you have to complete your tasks. If you're into puzzles and city-building there is no reason not to try it. You will thank me later. Публикувано от Sharki в 0:41 ч. Magic: Duels - Free mana for everybody!